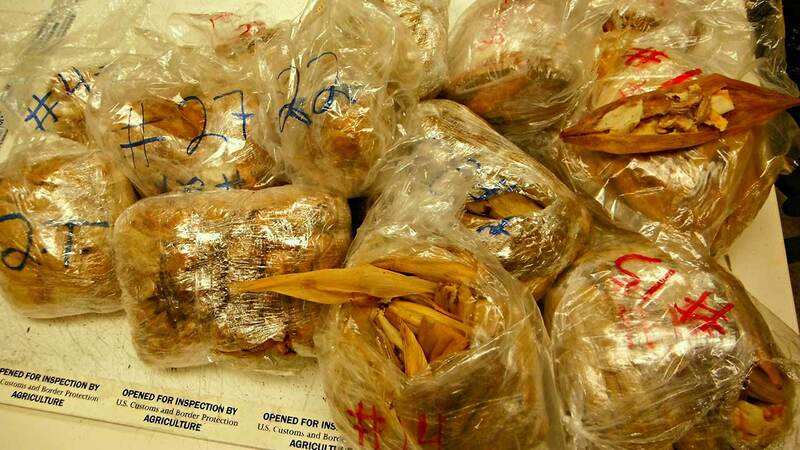 LOS ANGELES -- A passenger arriving at Los Angeles International Airport from Mexico was fined $1,000 after customs inspectors discovered 450 illegal pork tamales in the traveler's luggage. The incident occurred on Nov. 2, U.S. Customs and Border Protection officials said Wednesday. The passenger declared bringing food into the country on the customs forms, but when asked if the food contained any pork meat products, the passenger verbally said no. Agriculture specialists then inspected the passenger's luggage and found 450 illegal pork tamales wrapped in plastic bags. "Although tamales are a popular holiday tradition, foreign meat products can carry serious animal diseases from countries affected by outbreaks of Avian Influenza, Mad Cow and Swine Fever," said Anne Maricich, CBP Acting Director of Field Operations in L.A. "Every day CBP agriculture specialists prevent the intentional and unintentional introduction of harmful pests and foreign animal diseases into the U.S."
The passenger was fined $1,000 for commercial activity with the intent to distribute and the illegal tamales were destroyed, customs officials said. U.S. Customs and Border Protection officials seized and destroyed 450 illegal pork tamales from a passenger at Los Angeles International Airport on Monday, Nov. 2, 2015.